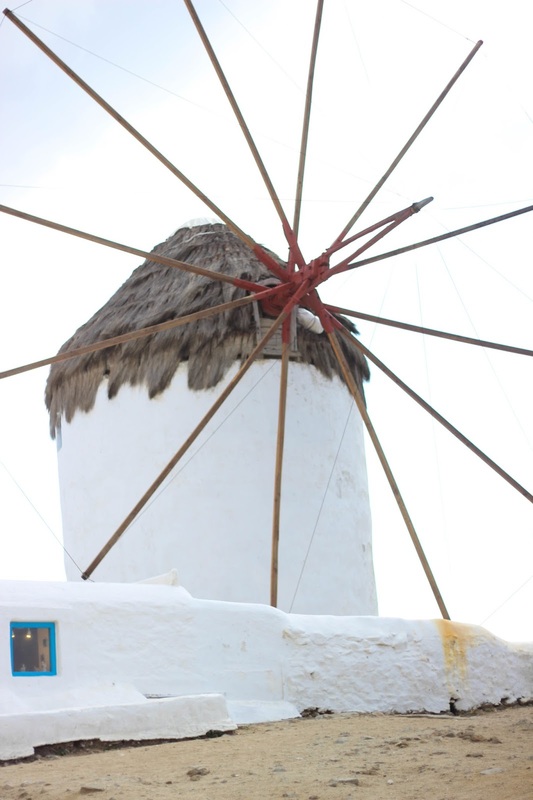 During our honeymoon, we actually started in Mykonos first. To be honest, on that first day, we didn’t do much. After being up and traveling for 24 hours, we were exhausted when we got to our hotel. It was definitely a relaxed day and we just hung out by the pool. Thank goodness the pool had a gorgeous view! The second day was action packed! We took a day trip to the island of Delos. For those who are not familiar with Delos, it is an island that is famous for Greek mythology. Moreover, this island had civilization back to at least 2000 B.C. and some of the artifacts and parts of houses & buildings are still up. It’s like stepping through a time machine at the island. I’m really amazed how a lot of that still exists. They have a museum there filled with stuff archaeologists excavated. It was pretty cool. 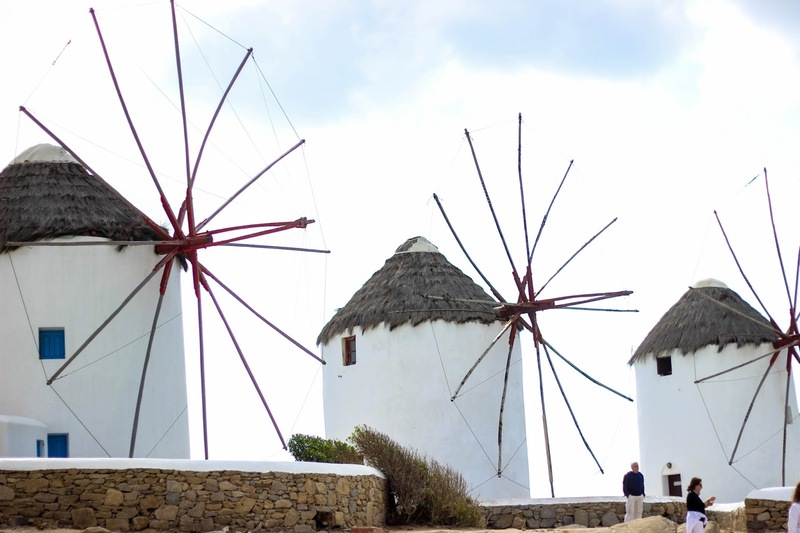 After taking a ferry back to Mykonos, we stopped by the famous windmills. They were beautiful! 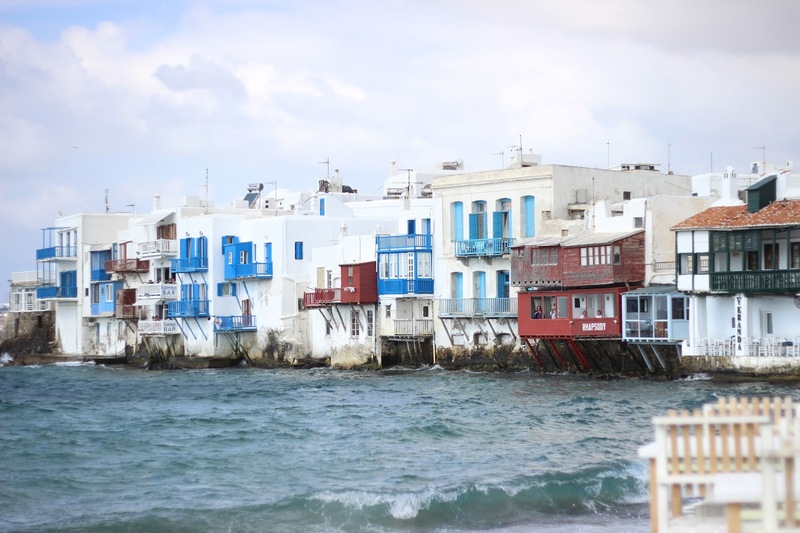 Everything about Mykonos Town was beautiful! Every corner I turned, it was worthy of photo. I was in love with the white walls with splashes of pastels and vibrant colors. Since I knew we would be doing a lot of walking around, I wore the comfiest pants from J.Crew. They’re beach pants, but they’re also perfect for lounging around as well. I tried to dress it up by wearing a cropped off-shoulder top. You look so cute and comfy, I absolutely love this look! LOVE the outfit. perfect for mykynos!! 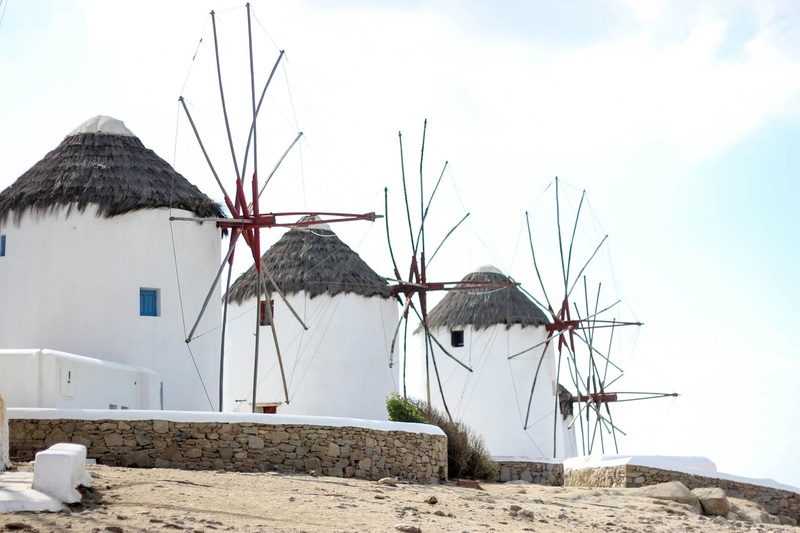 i've always wanted to visit and see the infamous windmills! Thanks girl! It is totally worth the trip! Mykonos is just so amazing!! Your pictures are fabulous and you look gorgeous!! Your honeymoon/ vacation style is killer! I love the loose fabric and relaxed vibes. Exactly what you want be when on vacation. (: Have a great weekend Rach! Thanks Kiki!! Hope you had a good one too! Love your off the shoulder with the relaxed pant. Perfect for exploring. Sounds like it was amazing! 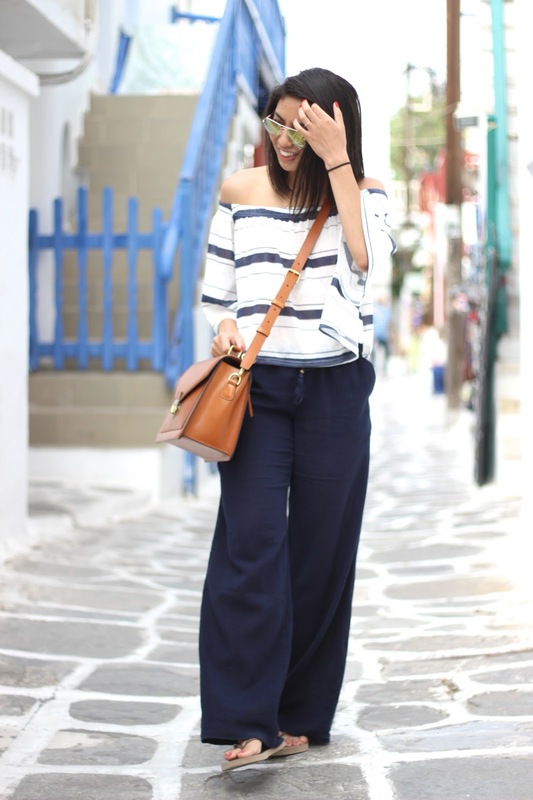 Your outfit is perfect for mykonos! I love this outfit! 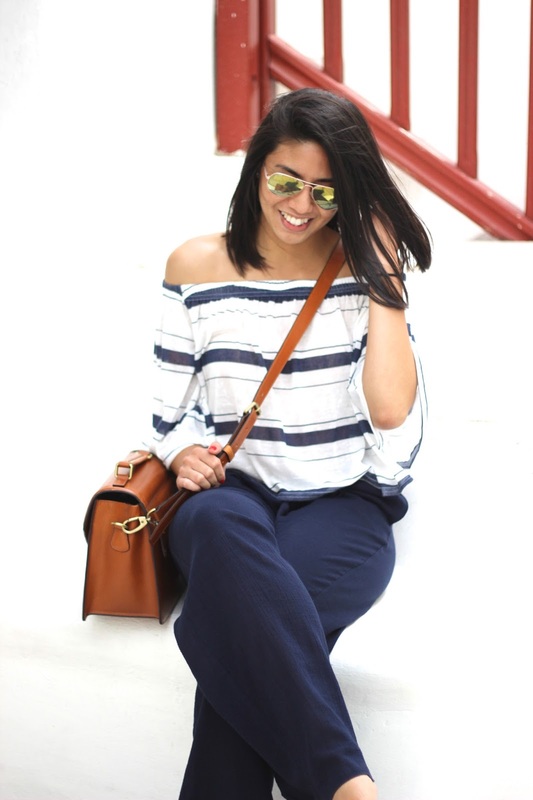 Nothing pairs better with stripes than a classic tan bag. This looks so breezy and effortless. Your photos are so beautiful – it looks like you were walking around in a perfect postcard moment! Even your outfit matches the scenery so perfectly. I always find you need to have that day or so to just RELAX and take in your surroundings a bit before jumping into that go-go-go tourist schedule….but it's so key to see as much as possible! Thank you so much Jackie! I totally agree with you! Now I have a travel fever and want to go somewhere again! So glad you loved Greece! Those pants looks so comfy and the outfit fits the colors of the island! OMG, Rach! I love this off the shoulder top in this perfect setting! Loving this casual look. So jealous of your travels! It seems you had a wonderful honeymoon. I love the J.Crew pants! 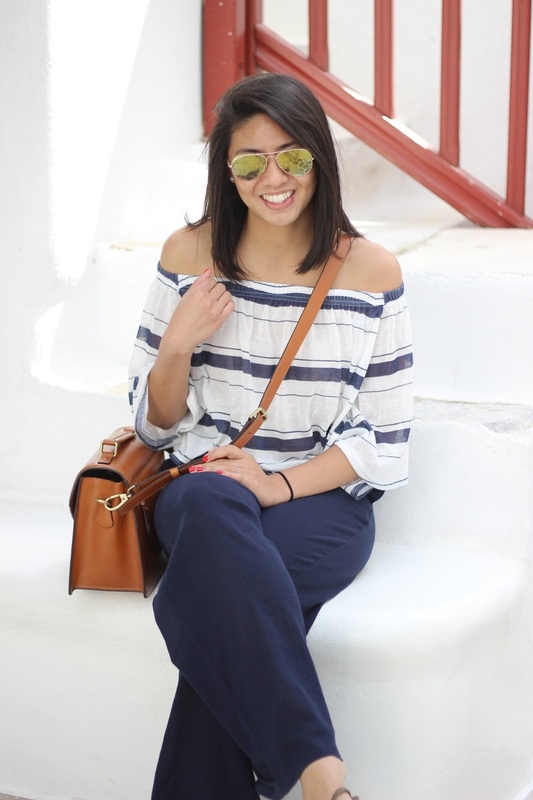 You wore the perfect outfit to visit Mykonos. You are gorgeous! Love your style and your blog. Such a cute outfit that is perfect for traveling! Also this location is just stunning…amazing, amazing, amazing! I love that purse! Cute and comfy outfit! Thanks Ashan! Thanks for stopping by! I love Greece!! There was my honeymoon!! And you look so chic dear! It's such a pretty place! Thanks Monica! 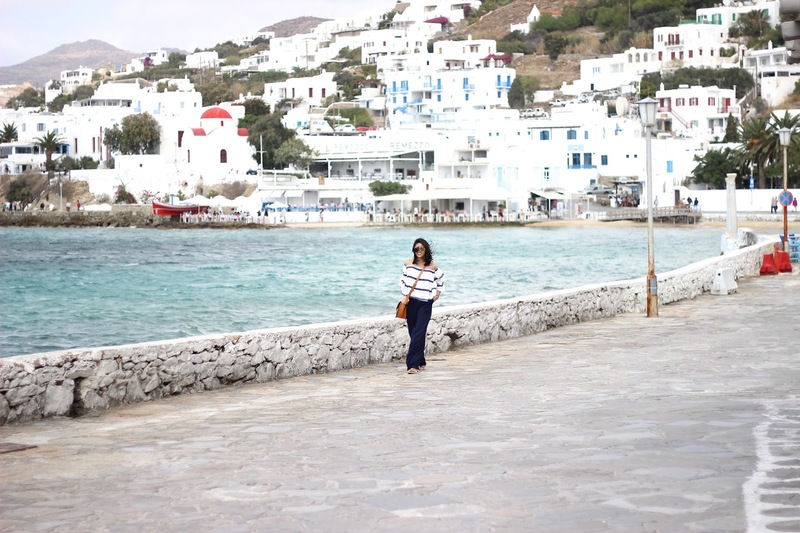 Your navy outfit fits the blue-white scen of Mykonos beautifully. You look beautiful! I love how you documented all of your travel, it's been so fun to follow along! Wow what a place, stunning pics. 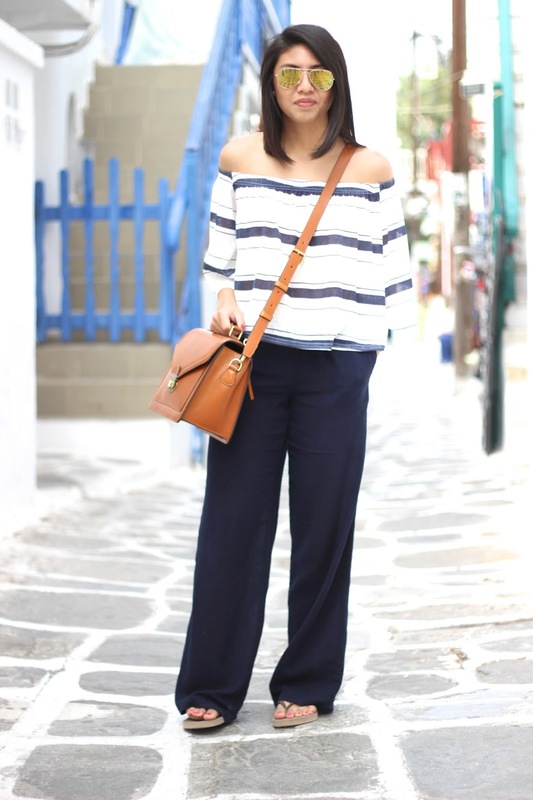 Love ur Mediterranean style and this bag is just so perfect!